Today’s post is entitled, “Tapadh Leibh”, which is Scots Gaelic for a formal thank you. I’d like to extend sincerest appreciation to two friends from the Restigouche region, who donated roofing tin and asphalt shingles to our cause. Generosities like this go a long way in helping new/young farmers stay out of debt in their agricultural pursuits. Infrastructure, small or big, along with farm machinery are often the most expensive costs for a foray into livestock housing. We are able to reduce costs by making our infrastructure portable, which lessens the amount of building materials needed to seasonally house livestock. One can imagine how deflating and defeating it would be to take an industrial approach to farming and have to go in debt in order to build a new state of the art barn, for example. Grass based farming circumvents that problem completely. A more natural approach to animal husbandry allows one to slowly grow their farm. One can grow with the enterprise and learn how to adjust and correct any unforeseen troubles as they are encountered instead of becoming overburdened and worked to exhaustion. This year we decided to try our luck with pastured chicken and were successful as a farming family. This winter we will reap the healthy ovalish egg fruit of our laying hens. Next spring, we will plant our apple orchard and raspberry field. As we continue to diversify our family farm, we would like to extend an invitation to those of you who are interested in learning about our passion for farming to contact us about farm visits. Over the years, members of the community of Point La Nim and nearby towns and villages have often stopped in to assist us with haymaking or harvesting our gardens. As a youngster, I can still picture family friends and community members pulling into the field with their work gloves and pick-up trucks. Without their help, we would have had many more days making hay under the moon light. Farming is, in essence, a community driven entity. We believe in paying it forward. The help of community members and other like-minded organic food enthusiasts can be paid forward in so many ways when you operate a farm. Food is usually the currency of choice. In the words of our Scots Gaelic speaking ancestors, “Slainte Mhath!” In other words, good health to all of you. 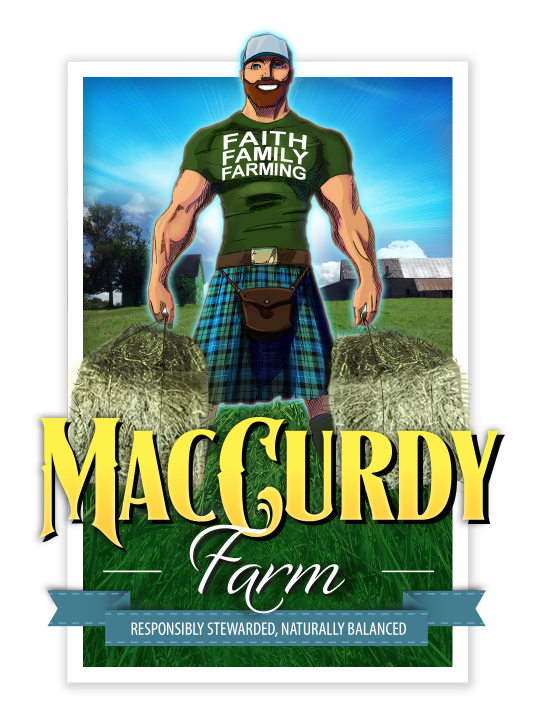 The MacCurdy Farm logo was designed to reflect the physical demands of farming, our Scottish heritage, and grass as the source of life for our pastured livestock, MacCurdy farm has, for the longest time, operated as a cow-calf operation with approximately 30 – 35 head of cattle through the year. Originally, we had wanted to include a cow in the logo but for simplicity sake we decided to focus on the kilted farmer. The kilt is a very close approximation of the kilt pattern for the modern MacCurdy kilt originally found in the MacGregor-Hastle collection. Our family wears this tartan for ceremonial, cultural, and casual events. The tartan is an identifying piece when it comes to our ancestry from the Isle of Arran, Scotland and hopefully for our brand of naturally raised livestock and organic produce. The t-shirt with the print, “Faith, Family, Farming” reflects our position on the three F’s, as we call it. We believe that God has provided us with land to steward, we believe that in order to run and operate a successful family farm we must place our relationships before all other farm business, and we believe that farming is what we were born to do. In our approach to farming, we believe that it must be done in the most natural way possible by balancing the soil to provide a nutritious salad bar for our farm animals. The farmer standing between the two hay bales exemplifies this balance and just as the body compensates on every step taken, the farmer must seek balance on every decision made on the farm. The background of the farmer is the farm as it is seen today. The original farmhouse of our ancestors who settled in 1832 is positioned behind the right arm, while the barn which house our cattle during the winter is behind the left forearm. History plays a very important role in our perspective of farming. In order to move ahead with our diversification of the farm through organic practices we must respect and appreciate every family member’s contribution before us. Responsible stewardship is a multi-generational practice that involves optimizing the level to which an animal can be itself in our cold Canadian climate. Adding to previously existing practices like strong animal care and ethical treatment allows the experienced and new farmer to both grow toward more and more responsible stewardship. Finally, the farmer has a beaming smile partially hidden behind a red beard, which is exactly how we want to greet you. Farming is not a dreary existence but rather a lifestyle that brings much joy, happiness, and laughter from drawing close to nature, animals, and plants in our daily walk on the farmland acreage.